Tired of running to save itself of the humans who tried catching it, a crab that lived on the shores of the Backwaters of Kochi, left its abode on a sunny mid-day, leaving its wife, children, relatives and friends, once for all. Very cautiously it moved forward and on making many a tumultuous exercise it was fast approaching the nearby Railway Station. By twilight it had reached the Kochi Railway station. Silently it climbed over the engine of the train that was resting in the yard and sat in a dark corner. At night, dreams of joyful angst enveloped its sleep. When it was opening its eyes in the morning, the engine of the train was lying in the same yard, still. The crab had a realization that the bogies for passengers were being attached to the engine. The level of heat was getting slowly increased in the surrounds and was becoming unbearable for the crab. It got up from the place and moved to the adjacent bogey and placed itself in a corner. The train was running in full speed. Hunger bewildered the crab. The chemo-receptors in its antenna got livened up, but not of much use. There was nothing available around to eat! How would I get some food? No chance, however; I have to bear this. How many days this train would continue running? Two? Three? Anything that moves will have to come to a halt one day. I should leave the train only after it is taken to a yard. No humans would be there. There would not be any fear where there are no humans. The train continuously ran for three days. It stopped somewhere in the afternoon of the third day, rested there for some minutes. Then it moved towards the yard, by pulling the bogies behind and having no sounds of any human being. The crab had made a sigh of relief. It slowly got down from the bogey. Once it jumped on to the ground, it started searching for some food and ate in haste whatever it could get. Then by crossing the rails and the railway station, it started moving forward. On the way it met a grasshopper. “What is this place called?” the crab had asked. The grasshopper went away hopping. The crab continued his walk. After many hours of walk, the crab had reached the banks of Yamuna. It had noticed that many people were engaged in angling there. Human beings! Fearing them was the reason of fleeing, and lo! They are in abounds, not even bothered about the quality of water in the river, the crab rued. Calmly the crab walked through the bank of Yamuna. It reached a place where there was none around. It had made a house for himself in the sand on the banks of Yamuna. Preying, sleeping and taking sun-bath as per its convenience and without any threat or interference of humans, the crab lived there for many months. “What a boring life!” the crab had thought. Earlier, running was constant to hide itself from humans, and therefore its physique was in perfect shape. Now, none chases it. Fat got accumulated into its body system. Lethargy was slowly setting in! This reasoned the crab moving to a place where human habitation was rampant. Many people where engaged there in washing clothes, taking bath and in angling. The crab, cautiously watching who that follows it and preparing to run faster, tried raising itself as a six-footer on its six legs and moved alongside the water. Many people had seen the crab and the crab also had also seen many people. But none tried chasing it. Then it started moving very closely with people. No! None had shown any semblance of sighting a prey nearer. The crab became still fatty. Weight increased. Movement became a bit more difficult. The crab was in dire grief. During this grief-stricken period, the crab had met an elderly frog. The frog was playing with its vocal sac. Not a good time, the crab had thought. “Good Morning”, the crab had greeted the frog. “Morning”, the frog folded his hands in obeisance, “you….? “A very good decision”, the frog had smiled. At that moment, a man was passing through them with an angle in his hand. The crab tried standing on his legs, readying to run. That is it!! Ageing brings forth wisdom is not an adage to be applied to this senile frog!! Am I so ugly looking? Never, we, the whole crab-clan could feel so. At home, this figure of me was so endearing for many who ran after me, nay, ran after the whole crab family. Here the frog with its bulging eye balls and inflated vocal sac says I am despicable…..My foot!!! With its right hinder foot the crab stamped on the floor, not once, twice. That night, while sitting in its house, the crab had sobbed, cried aloud. Hard thoughts and weird feelings surged through his mind. On the following day, the crab again tried getting attention from the human beings. None seemed noticing him. Enough of it! rued the crab. Hereafter we are seeing the crab sitting pretty at the lower ebb of a passenger coach of Mangala Express that was waiting for the green signal to appear, at the Hazrat Nizamuddin Railway Station. The crab had identified the train by listening to the chaste Malayalam language spoken by the passengers and the hangers-around. On the third day, the crab got down at Kochi. Cautiously moving out of the coach and walking down in hiding for many hours, the crab had reached the shores of the backwaters of Kochi. 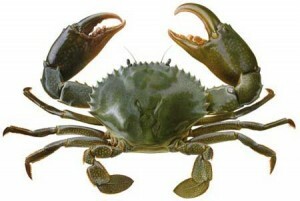 It was a reunion for the crab with its wife, children, many of its close relatives, friends and acquaintances. And the crab had heaved, sobbed and cried on seeing them again after many months, and feeling itself as one among them. “While leaving you said that you would never be coming back”, they all had surrounded it and had asked. Many questions, doubtful queries, suspicious look…. The crab laughed in humility like a saint. At this moment, they all had seen that a person was fast approaching them with nets and a wicker-basket, from the other end of the shore. Our protagonist saintly crab, its family and those who were present around him, had started running helter-skelter. However, the man had grabbed a crab from the group. While crying for the one that had gone, the crab was enveloped by life in its full form. Kunnamthanam Ramachandran (KRC Pillai) is a Malayalam writer, has written over 80 short stories in Malayalam and published two Novels. “Enigma”, the short story we publish here, as translated by the author himself, was originally written and published in Malayalam as “Durooham” . An excellent short story. It speaks of the importance of trials and tribulations in our life. One of the roadsigns reads – “Speed Thrills, but it kills.” Many drivers don’t pay any heed rather they speed …. Adventure of beating death is what they love. Life is matter of choice …. between tranquility and thrill, he chose the latter! A popular road sign reads : ” Speed Thrills, but Kills.” But many motorists don’t pay a heed to it and speed away trying to beat death time and again. The crab – the protagonist in the story – finally chose adventure to tranquility. An excellent story for the manner in which it has been told. Life is like that human beings are not happy in all situation so one has to understand all the time is not same happiness and sorrow both comes and we even like crab searching happiness and at the end reached to square.